Menicucci is carved out of an Italian family tradition, flavored with passion and dedication. Beginning in 1970, Antonio Menicucci planted his first grapes in Ortona, Italy. Three generations later the Menicucci legacy continues. Menicucci proudly produces a variety of organic hand-crafted wines, and sparkling wines that satisfy every palate ranging from unique, fruit-infused wines to traditional white and red varietals. Along with our love and passion for making great wines, we are committed to delivering superior quality and unforgettable memories. Our unique and continuous innovation techniques have inspired us to become amongst the industry’s most admired Italian wine brands. Our business model is based on values of transparency, integrity and finesse. We consistently strive to deliver high quality products and unforgettable experiences. Each of our wines have a story, a story that has charm; a story that is a based on true Italian wines. At Menicucci, we bring our stories to life by working with artists and graphic designers to create the perfect wine label. Fabio Di Lizio was born in Ortona, Italy in 1976 and is currently teaching Graphics and Engraving Techniques at Accademia Belle Arti L’Aquila. He has showcased his work across numerous exhibitions and cultural events, and has also participated in international competitions and workshops. 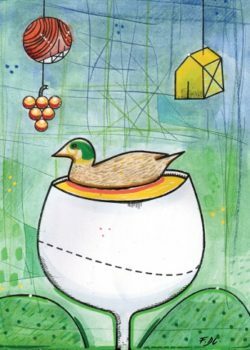 A nature’s gift: “Alzavola” is a green and blue duck, representing the colors of life. Alzavola wine is a true reflection of organic wine that interprets life and blends in perfectly with that of our home, the Earth. Fabio’s artistic style was easy to combine with Alzavola. In his artwork, Fabio uses the earth and house symbols repetitively. To fully adhere to our brand’s distinctiveness, Fabio used his unique artistic style along with our organic theme to represent our organic red and white wines. To combine nature with wine, Fabio shows Alzavola quietly lingering on top of a wine glass. Lorenzo Pisani was born in Pescara, Italy in 1987. He is a freelancer artist, who is especially passionate about digital art. Lorenzo uses his emotions and thoughts to guide his art work. His artwork is based on his mood at a current moment, that can easily be described in the lines and colors he chooses. Ginesia is the creation of the world, it is the origin. Lorenzo describes Ginesia in his painting by having many different colors ‘spiral’ together to create the perfect circle, our world. The several colors represent the different eras. In our four Ginesia wine labels, each label describes the origin in a particular way. Montepulciano reminds us of the flowers and the beauty of things. Cerasuolo remind us of the sun and our ‘light days’ on earth. Passerina reminds us of the sky and its birds as well as the sea and the great creatures of the sea. Pecorino reminds us of the nature, our green earth as well as all the living creatures on our land. Rama Disuky, a muralist and painter, born in Cairo, Egypt in 1991.Her signature characters function as a metaphor for her experiences and struggles in life. There is an element of the unexpected in the close examination of her paintings; as a viewer approaches what appears to be a surrealism painting, the surface dissolves into an abstract composition of aggressive brushstrokes. 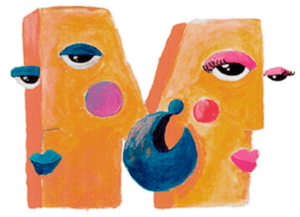 Rama used her figurative and surreal style to convey a message about Adam and Eve, united together in peace, love and respect by using the letter M. A creative method to show the love and respect connection between both genders together. 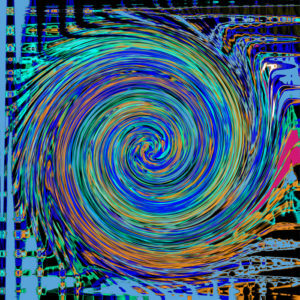 The vibrant colors used, are a way to manifest positivity and peace. As you look closely you’ll find an integration of circles, as a sign to describe the home feeling.